The airfoils files are not supplied with the TraCFoil software, but are supplied separately. 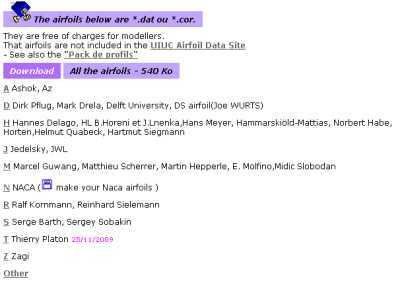 Therefore download the Pack de profils separately on the download page. Each end of line is terminated by the Chr (10) -> UNIX system code. the coordinates follow each other without returning to the line. but each end of line is terminated by Chr (10) + Chr (13) -> PC system. The comment line is usually placed at the end of the coordinates list. Between the x and y coordinates, the separator is at least one space or a tabulation. Do not enter 2 coordinates which follow the same values. the X of the first line must be equal to 1.
the X of the last line must be equal to 1. 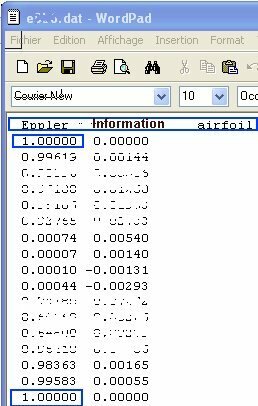 Can only be opened by File /Open Airfoil file or the Airfoils button.